In my cookbook, "Eating Healthy & Loving It" I offer many recipes to help you easily cook a healthy meal, quickly and affordably. Here I will offer some of those as well as other recipes and tips on how to makeover your meals. Spray a large skillet with cooking spray and cook chicken on medium heat for 15 to 20 minutes until done. Add ½ cup of the wine, lemon juice, shallots, and garlic and cook for 10 minutes. Add the oil and the rest of the wine and cook for an additional 2 minutes. Place all of the spinach and the green onions on top, cover, reduce heat to medium/low and cook for 5 minutes. After 5 minutes, stir, cover again and cook for an additional 5 – 7 minutes until spinach is dark in color and no longer firm. Comments: This is great especially if you are trying to show off what a good cook you are to all of your friends! Serve it over some orzo for a great Italian treat. Heat oil in a large skillet over med/high heat. Add the couscous and cook for a minute or so to toast. Add the curry powder and stir. 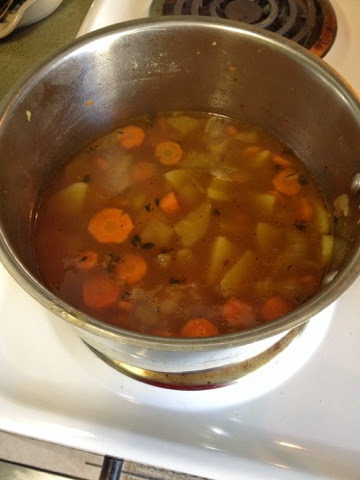 Add chicken broth, green onions and carrots and bring to a boil. Remove from heat, cover and let stand for 5 minutes. Comments: I use a mild curry for this so that it is not too spicy. You could also substitute cumin for the curry. In the cookbook, I have many recipes which I call "Comfort Food Conversions." They are lightened up versions of the original. Although they are not "low calorie, low sugar, or low fat" they are still better for you versions - and with all the taste. Boil sweet potatoes whole until fork tender. Let cool. Peel and place in bowl. Add the condensed milk and cinnamon and blend with a mixer until smooth. 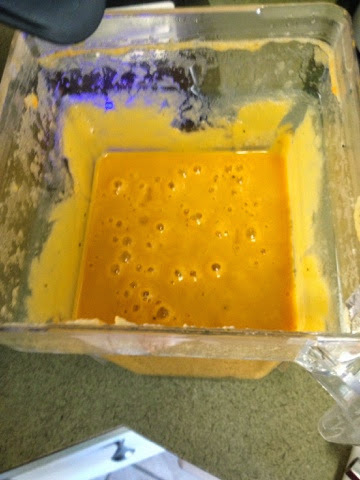 Spread mixture into an 8” square shallow dish. Top with a single layer each of the almonds and then the marshmallows. Sprinkle with cinnamon and bake at 350 degrees approximately 25 minutes or until marshmallows are melted and golden brown. Comments: Traditional candied yams are fattening because of all the butter. Sweet potatoes on their own are actually very good for you, containing a good amount of vitamins and nutrients. By making them this way, you are still getting an awesome flavor (even passes the kids' test) and a lot less fat! Yum yum yum yum yum! Yes, it's that good! Growing up, I always remember my grandmother making an amazing raspberry cake topped with a raspberry sauce. I could never get enough of it when we went to visit (that and the M&Ms she used to keep in the candy jar)! My other grandmother, the Italian, burnt everything she baked (true story), but none the less, the flavors were always wonderful. I wanted to create a sophisticated dessert, like the raspberry cake that my grandma made, yet still bring in the Italian flavors that I love (without the burnt flavor of course). 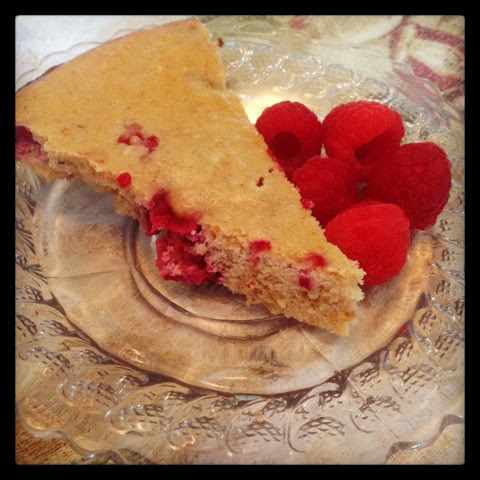 So here you have it, an almond raspberry cake that is full of healthy fats, high in protein, and low in simple carbs. You'll note that I use Swerve in place of sugar. I get it at Whole Foods, but I'm sure you can find it online and if not, use your sweetener of choice. Preheat the oven to 350°F. Spray a spring-form pan, with non-stick cooking spray and set aside. Place a piece of parchment paper on a baking sheet and spread almond flour on it. Transfer the baking sheet to the oven and toast for 5 minutes. Remove from oven and allow to cool. Meanwhile, in a large bowl, beat together egg yolks, ricotta cheese, almond butter, almond extract, lemon zest and 1/6 cup Swerve until smooth. In a separate bowl whisk together the almond flour and baking powder(I actually did this on the baking sheet). Add the flour mixture to egg yolk mixture and beat until smooth. In a separate bowl, beat the egg whites on medium high speed until they start to increase in size. Once that happens, add a pinch of fine sea salt and slowly add the remaining 1/6 cup of Swerve. Continue to beat until soft peaks form. Fold egg white mixture into the almond mixture a little bit at a time. Then carefully stir in the raspberries. Once fully incorporated, pour the batter into the prepared spring-form pan and place into the oven to bake for approximately 20 minutes until a fork inserted in the center comes out clean. The sides and top should also start to become golden in color. Note that cooking time will vary based on your size pan. I use a 10" pan which results in a thin cake and a 20 min bake time. If you use a smaller pan, increase your cooking time in 5 min increments until done. I love this cake as is, and as such I chose not to make a raspberry sauce for the top. It is perfect with a cup of coffee for dessert or for a morning treat. Enjoy! I know it sounds crazy... apples in soup?! Trust me on this, it is good! The russet potato in this recipe lends itself to a more comforting taste, and the mix of crushed red pepper and thyme balance out the sweetness. An additional bonus is that it also happens to be a vegan recipe. Now all I need to do is bake a loaf of homemade bread to enjoy with this amazing "soon to be Fall" treat! Slice all veggies and apple into equal size pieces. I like to slice mine thin so that they cook faster, but the most important thing is that they're the same size. Heat oil in medium sauce pan over medium-high heat, add onion, potato, carrots and apple. Add in crushed red pepper and salt/pepper to taste. Cook, stirring occasionally until everything is slightly tender, yet still has a bite to it. You should also get some browning in the bottom of the pan at this point. (If it seems like everything is cooking too quickly, lower the heat closer to medium.) Once you've reached this point, add in 1/2 the thyme and let cook for another minute or so. Add the water, cover and allow to boil over med-high heat until everything is very soft. It's important to cook until very soft versus fork tender to ensure a smooth consistency. Turn off the heat and allow to cool slightly in pan. Then purée either in your blender or with an emersion blender. 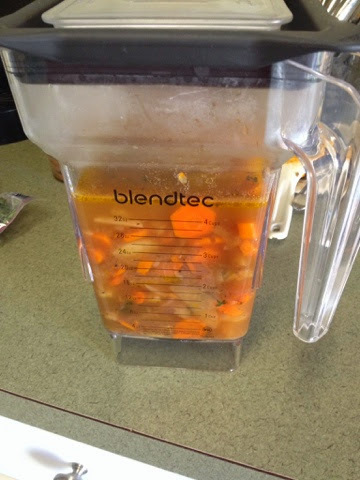 I have a Blendtec, and in that I pulsed a couple of times to combine, then blended at speed 1 for 15 seconds and then on speed 5 for another 15 seconds. The main thing is to purée until it is super smooth. Stir in the rest of the thyme and add more salt/pepper if needed. 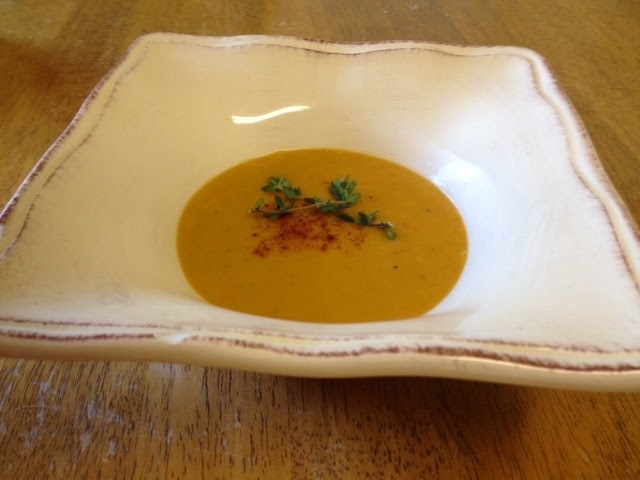 Pour into 4 individual bowls and garnish with paprika and thyme sprigs. Sometimes, you just really want a candy bar, but don't want all the processed junk that comes with it. Don't fear! 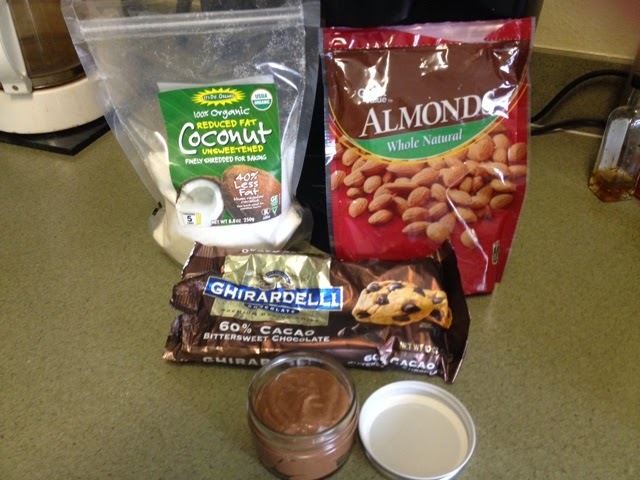 I've come up with a great treat that satisfies those cravings while offering heart healthy ingredients! 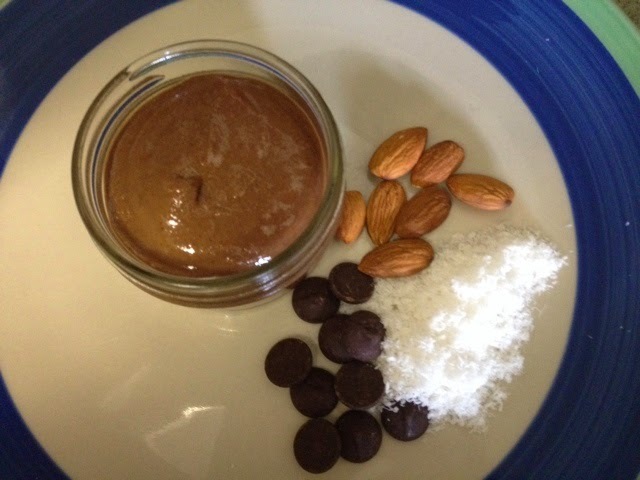 My Almond "Joyous" Butter really hits the spot, and can be enjoyed straight out of the jar! If using a high powered blender such as a Blendtec or a Vitamix, simply add ingredients to your blender jar and process until smooth. This can usually be accomplished in a couple of minutes. 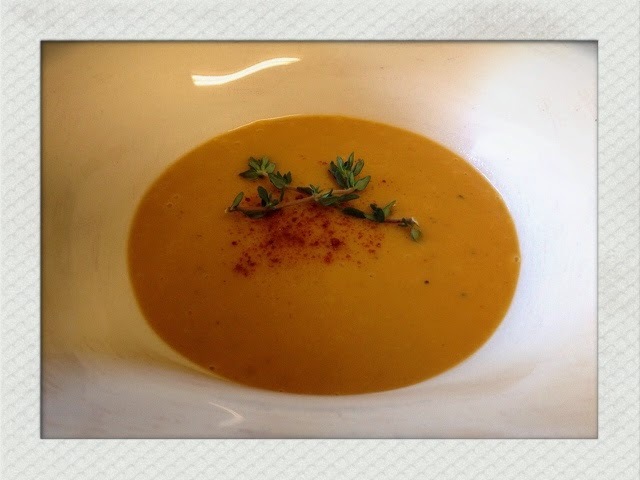 If using a food processor, add all ingredients to the processor bowl, and process on high for 20 minutes. You can process for only 15 minutes, but going the full 20 will give you a smooth and creamy consistency. Per serving: 90 calories, 7 grams heart healthy fat, 5 grams carbs and 3 grams protein. Having been raised by an Italian chef, I have always had a passion for food. I find great pleasure in developing recipes and seeing where my mind and tastebuds can lead me in the kitchen! The more I cook, the more I enjoy finding ways to use bold flavors instead of heavy ones to bring out the best that the food has to offer. Click on the image above to order your copy of the cookbook from Amazon!